Strictly limited! 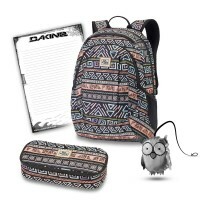 This sensational Dakine School Set you get exclusive only here in Dakine Shop! Get trendy and you the perfectly color coordinated Dakine Garden 20L + School Case XL + Emma Block School Set Paulina at a reasonable set price! Besides Dakine school bag and pencil case a cool Beach are block, anda satchel reflector for a safe school included. Customer evaluation for "Dakine Garden 20L Paulina + School Case XL + Emma + Block School Set Paulina"